So a couple months ago the tractor started running terrible.. Missing and sputtering then wouldn't restart after it died. No fire to the plug, but it would turn over fine. Today I got around to looking at it and with key on, I have power to the coil. I replaced the coil, but now I'm not getting power to the starter. The switch seems to bench test fins as it is open normally, and closes when button is pushed, yet I get no power to the starter with it mounted. SharpTJ ,Hook the switch up to the battery cables,but don't bolt it up behind the dash.Then with the transmission in neutral push the button and see if the starter works.Some new switches need to have a couple flat washers soldered to the push button to make it longer for it to work. I also just tried to direct start it using jumper cable to the starter and it was a no go so instill have the nonfire issue I guess in addion. Clean the battery posts and cables. If that doesen't help, then clean the other end of the cables. So you had battery at the top of the coil, it ran bad so you bought a new coil. Did you even look at the points? Check the gap? See it they are pitted? Starter, not sure why it failed. points look good and clean... Gap is right on. SharpT,You say,Guess I'm going to order a coil... It shouldn't need a resisted as I'm. Still. 6V. Yes if it is still 5 volt you also need to order a OEM ballast resister for the coil for things to be correct. I realize now what was meant... When he said "inline" I was thinking an additional resistor that may be used in 12v... The ballast resister is still good (has continuity) and mounted behind the dash. I don't know where you guys are reading this crap about Ford N's burning up coils -the Green & Yeller board??? ; > ) In all of my 60-+ years, I've never burnt up a coil or points for that matter. As stated, you must be leaving your key ON at shut down. I suspect you have mucked up wiring and are not listing more of your setup. OKAY, you say you are wired as the OEM 6V/POS GRN system, right? A correctly done distributor tune-up is essential. Did you set the timing correctly after you installed new points? Did you perform a continuity test on it before assembling the unit back on the tractor? Your 9N,if after s/n 12500, should have the square can 6V coil, a 1-Wire/3-Brush Generator; the roundcan cutout circuit; the OEM Ballast Resistor; a 1-Wire starter motor with NO solenoid; key switch, ammeter, neutral safety starter push button switch, and all wired correctly to OEM schematic. You do not need to buy another coil, or any other other resistor. 6V or 12V, BOTH REQUIRE the OEM BALLAST RESISTOR. You DO NEED THE EXTERNAL RESISTOR ONLY if using a 6V coil on a 12V switchover job. 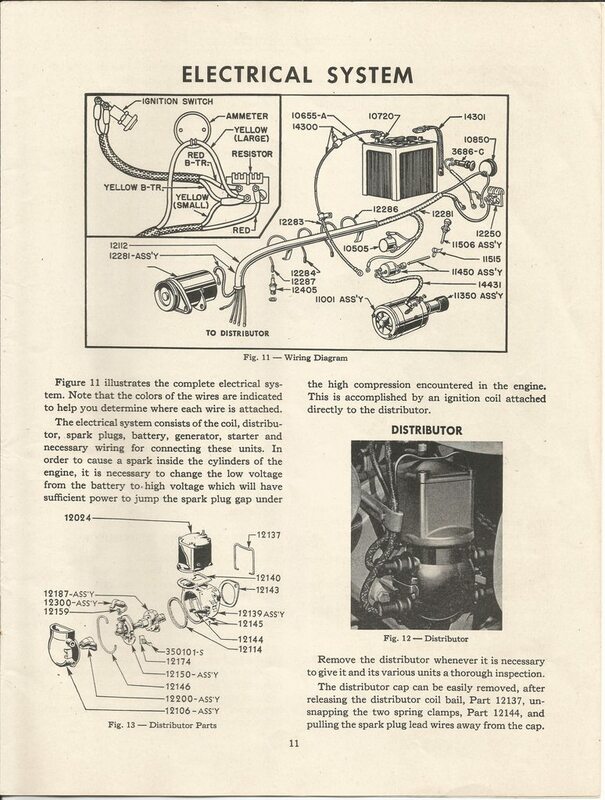 Get the distributor right first, go thru the entire wiring system for accuracy. You will check for spark after unit and wiring is correct. 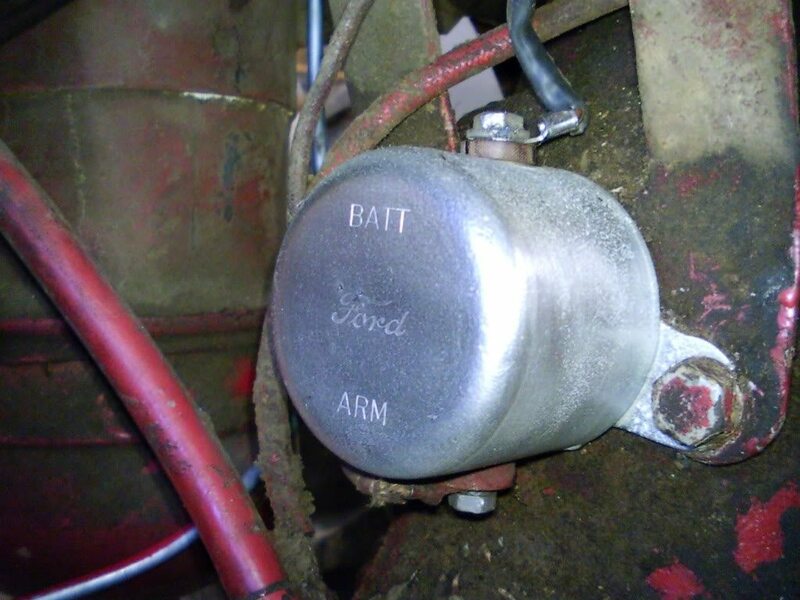 Forget the starter, that isn't your problem unless wired wrong. Ditto with coil too. Test your coil static with your VOM. Set to OHMS, probe 1 on pigtail, Probe 2 on terminal stud. Reading should be about 1.3 OHMS static. Net, VOM set to DC VOLTS, Probe 1 on LH terminal (as viewed from front) of Ballast Resistor -that is where the coil wire connects to, and Probe 2 anywhere to Ground. Turn Key Switch 'ON' but do not crank over engine. You should see battery voltage if points are open, and half that if points are closed. 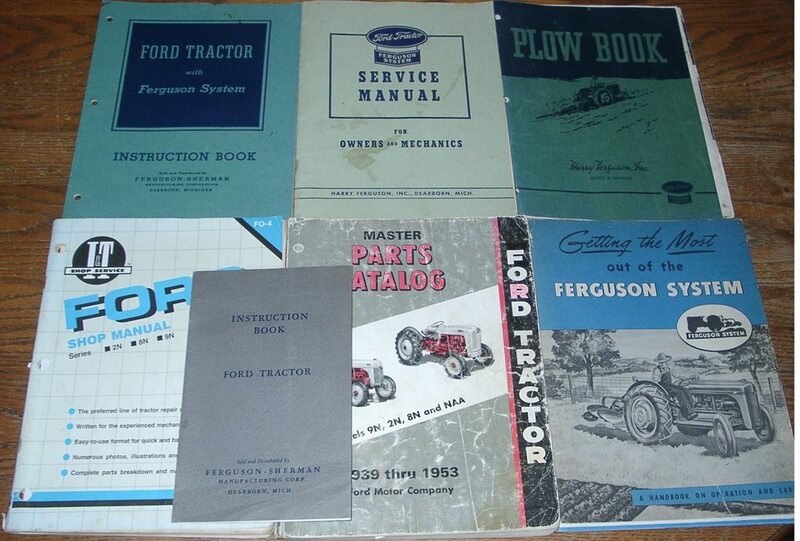 Do you have the essential owner manuals? I don't know where you guys are getting this information about 9N's using a lot of coils. That is not accurate. I have been running a 12volt coil on my 9N with a 12 volt conversion since 2003 on the same coil with no resistor. (quoted from post at 12:36:38 01/09/19) I don't know where you guys are getting this information about 9N's using a lot of coils. That is not accurate. I have been running a 12volt coil on my 9N with a 12 volt conversion since 2003 on the same coil with no resistor. but no - i put in a 12 volt coil, and it made zero difference. last winter, i replaced the key switch and condenser. one of those two was the culprit - it ran great all summer this year. Even if that resistor checks with a meter I would replace it. They are cheap and can be weird. (quoted from post at 05:29:09 01/10/19) Even if that resistor checks with a meter I would replace it. They are cheap and can be weird. Alright... I "think" this project was wired correctly... 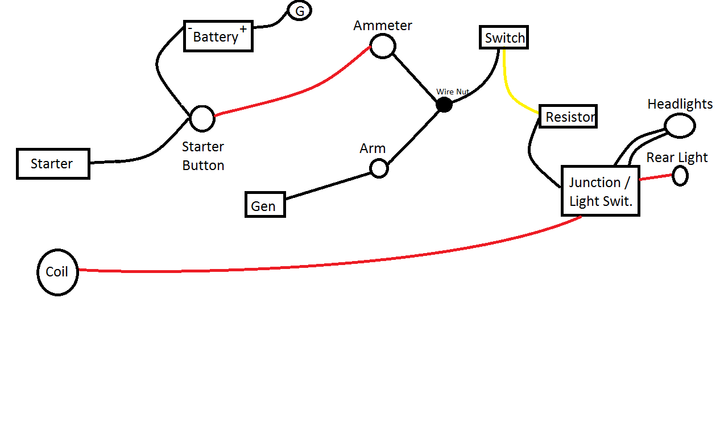 I cleaned all the connections and drew a quick little schematic.